Level Field: False hopes for CWG? The embarrassment for the Commonwealth Games Organising committee just does not seem to abate. 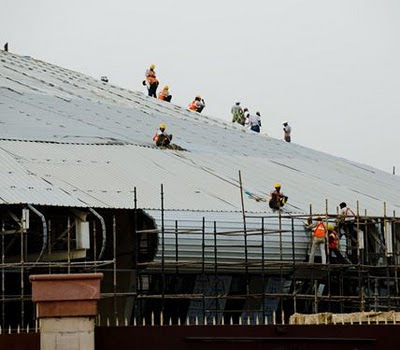 A day before the delegates arrive for the Commonwealth Games another embarrasment for the CWG A false ceiling at the Jawaharlal Nehru stadium collapsed on Wednesday (September 22). This latest incident comes less than 24 hours after a foot over bridge collapsed on Tuesday at the same venue. On Wednesday (September 22) the false ceiling of the weightlifting venue (above) at the Jawaharlal Nehru Stadium collapsed. This is the same venue, which recently had a water logging problem when Delhi received some heavy rains. Reacting to the incident, Cabinet Secretary KM Chandrashekhar said the false ceiling collapsing was 'not a big issue'. He added that, "The cables which were to be set up for the data network were placed on the false ceiling and due to the weight of the cables the ceiling fell off. It's a minor thing and it will be corrected. It's not a matter to be worried about." Chandrashekhar went on to claim that all main venues as well as practice venues and also the games village were ready for use. He said, "We have put in place a damage control exercise. There have been some complaints about the residential rooms. We have asked the LT General to set up a meeting and look into it." However, the Commonwealth Games Federation CEO Mike Hooper has washed his hands off the CWG mess.Speaking exclusively to TIMES NOW, Hooper has said that he wasn't concerned about CWG's day to day affairs.